Thanks to modern innovations to the field of dentistry, tooth restoration is easy, affordable and more painless than ever. Galleria Dental’s custom-made, same-day crowns restore teeth to their original shape, size and color. And best of all, our dentists can prepare, place and bond a same-day crown all in a single visit, meaning no more endless dentist office visits for you! Galleria Dental produces natural-looking same-day crowns that retain the appearance of real teeth so that no one will be able to tell the difference. 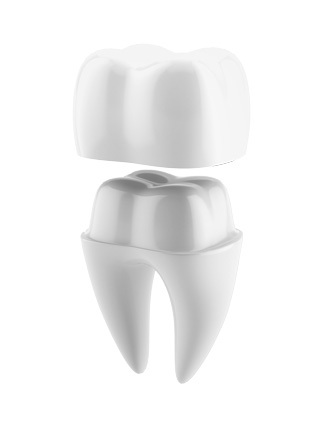 Using state-of-the-art imaging technologies, the quality of our same-day crowns is impeccable. No sticky or messy molds, impressions or temporaries of your mouth have to be made. Moreover, this quick and convenient procedure takes about an hour of your time so that you’re not in a dentist’s chair any longer than you have to be! How are same-day crowns made? Step 1: A Galleria Dental specialist takes an optical image of the damaged tooth using CAD/CAM (computer-aided design and computer-aided manufacturing) computer software. Step 2: Through the CEREC (Chairside Economical Restoration of Esthetic Ceramics) process, a dental health specialist transfers the image to a computer in order to create a refined 3D model of the same-day crown. Step 3: A milling unit drills the same-day crown from a ceramic block whose color matches your teeth. Step 4: The dentist places, polishes and sets the same-day crown, making sure the restoration fits properly within your mouth. In total, creating same-day crowns can take as little as an hour to complete, thereby saving you valuable time in the process. The CEREC process of tooth restoration is a method of CAD/CAM dentistry used by practicing dentists for over 30 years. In short, it’s a safe and secure means of crown implementation that saves you time and discomfort. Contact Galleria Dental today to learn more about our CAD/CAM and CEREC technologies. Schedule an appointment for a same-day crown for a time most convenient for your schedule. The benefits are so outstanding that it can’t help but put a smile on your face!